The concept of an Ephemerizer system has been introduced in earlier works as a mechanism to ensure that a file deleted from the persistent storage remains unrecoverable. The principle involved storing the data in an encrypted form in the user’s machine and the key to decrypt the data in a physically separate machine. However the schemes proposed so far do not provide support for fine-grained user settings on the lifetime of the data nor support any mechanism to check the integrity of the system that is using the secret data. In addition we report the presence of a vulnerability in one version of the proposed scheme that can be exploited by an attacker to nullify the ephemeral nature of the keys. We propose and discuss in detail an alternate Identity Based cryptosystem powered scheme that overcomes the identified limitations of the original system. 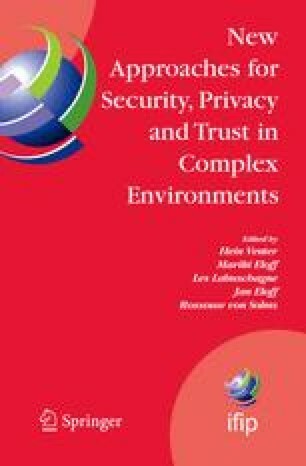 Please use the following format when citing this chapter: Nair, S., Dashti, M., Crispo, B., and Tanenbaum, A., 2007, in !F1P International Federation for Information Processing, Volume 232, New Approaches for Security, Privacy and Trust in Complex Environments, eds. Venter, H., Eloff, M., Labuschagne, L., Eloff, J., von Solms, R., (Boston: Springer), pp. 241–252.